Bandar Lampung is the capital and largest city of the Indonesian province of Lampung. 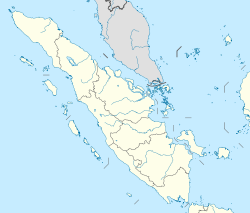 Located on the southern tip of Sumatra, Bandar Lampung was originally called Tanjungkarang–Telukbetung, since it was a unification of two major settlements in Lampung, before being renamed in 1983. As a gate of Sumatra from Java, Bandar Lampung is a culturally diverse city. The city and South Lampung Regency (which borders the city on its northern and eastern sides) are major transmigrasi recipients for those seeking respite from the crushing population densities and traffic nightmare of Jakarta, yet able to take advantage of proximity. 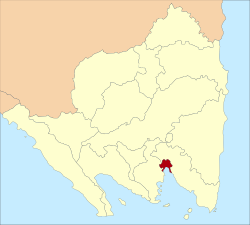 so this city became the largest city in Lampung and the third largest city on the island of Sumatra. Bandar Lampung City is currently moving towards the metropolitan city as well as the center of trade and services in southern Sumatra after Palembang. The city's area is about 118.5 km², with a population of 881,801 at the 2010 Census; the latest estimate (for 2015) is 1,166,761. Since 2010, seven additional districts have been created by the splitting of existing districts, bringing the total to twenty districts. The new districts are Bumi Waras, Enggal, Kedamaian, Labuhan Ratu, Langkapura, Telukbetung Timur (East Telukbetung) and Way Halim. 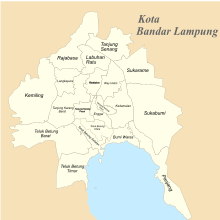 District divisions of Bandar Lampung. Bandar Lampung is served by Radin Inten II Airport (TKG), in the neighbouring county of South Lampung. The airport can be accessed by public transportation, such as bus and mini bus. Bandar Lampung has several road transportation alternatives. The most popular is a minibus called angkot, an abbreviation from Angkutan Kota (literally translated as City Transportation). They serve routes throughout the city, operated privately and cheaply. Usually, an angkot covers some area between Tanjung Karang (heart of Bandar Lampung) and an urban area. Currently, routes covered are Tanjung Karang - Garuntang, Tanjung Karang - Teluk Betung, Tanjung Karang - Rajabasa, Tanjung Karang - Sukarame, Tanjung Karang - Langkapura and many more. 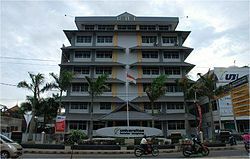 Bandarlampung Transportation Office has announced that in October 2011 will serve two of seven routes planned by Bus Rapid Transit — the Rajabasa-Sukaraja and Sukaraja-Korpri housing complex in Sukarame. Tanjung Karang Station in Bandar Lampung is the terminus of the railway service from Palembang, although the railway track continues all the way until Panjang harbor and Tarahan coal offloading point. Many express trains connecting this city and Palembang, including Limex Sriwijaya and Rajabasa Express. In 2009, Bandar Lampung has a literacy rate of 94.3%, slightly increased from 2005 which was 93.5%. However, the high school participation rate kept decreasing from 69.2% (2007) down to 61.4% (2009). On the other hand, high school participation rate in Indonesia rose from 54.6% in 2007, to 55.8% in 2010. 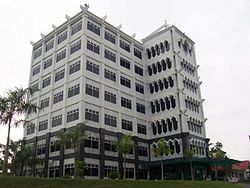 There are some notable high schools and universities in Bandar Lampung such as SMP Negeri 2 Bandar Lampung (public), SMP Negeri 1 Bandar Lampung (public), SMA Negeri 9 Bandar Lampung (public, known as Smalan), SMA Negeri 1 Bandar Lampung (public, known as Smansa), SMA Al-Kautsar Bandar Lampung (private), SMA Fransiskus Bandar Lampung (private), SMA Xaverius Pahoman (a Catholic private school teaching students from kindergarten to high school, locally known as Xavepa), Lampung University (public, locally known as Unila), Bandar Lampung University (private, locally known as UBL: Universitas Bandar Lampung),Muhammadiyah University of Lampung (known as UML: Universitas Muhammadiyah Lampung and Malahayati University (private). In March 2011, Unila already had 70,866 alumni. ^ "Population Census 2010 Province LAMPUNG". Badan Pusat Statistik Indonesia. 2010. Archived from the original on 27 September 2011. Retrieved 3 July 2011. ^ "Indeks Pembangunan Manusia 2007" (PDF). Badan Pusat Statistik Provinsi Lampung. 2007. Retrieved 3 July 2011. ^ "Peraturan Pemerintah Nomor 24 Tahun 1983". President of Republic Indonesia. 1983. Retrieved 5 July 2011. ^ "Bandarlampung to unveil BRT as passenger-friendly transport". 22 September 2011. ^ "Angka Melek Huruf Penduduk berumur 15 tahun ke atas menurut Kabupaten/Kota 2005-2009" (PDF). Badan Pusat Statistik Provinsi Lampung, Indonesia. 2010. Retrieved 3 July 2011. ^ "Angka Partisipasi Sekolah menurut Kabupaten/Kota" (PDF). Badan Pusat Statistik Provinsi Lampung, Indonesia. 2010. Retrieved 3 July 2011. ^ "Indikator Pendidikan Tahun 1994-2010". Badan Pusat Statistik. 2010. Retrieved 3 July 2011. ^ "WISUDA: Unila Lahirkan 1.403 Sarjana". Lampung Post. 16 March 2011. Retrieved 3 July 2011. Wikivoyage has a travel guide for Bandar Lampung. 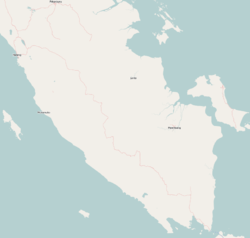 Wikimedia Commons has media related to Bandar Lampung. This page was last edited on 7 March 2019, at 05:21 (UTC).